Hilton HHonors reminds hotel guests there is another major U.S. hotel chain not yet owned by Marriott International. HHonors Holiday Bonus is 2,500 points for stays of two or more nights in December at any U.S. Hilton brand hotels. HHonors Promotion Registration: Dec 1-31, 2015 Holiday Bonus 2,500 points. *Offer subject to availability at participating U.S. hotels and resorts in the Hilton Worldwide portfolio for stays completed between December 1, 2015 and December 31, 2015. Offer requires a 2 night minimum length of stay. Hilton HHonors™ members must first register at HHonors.com/HolidayBonus prior to check-out of your first stay within the Promotion Period. Registered HHonors members will earn 2,500 HHonors Bonus Points per stay during the Promotion Period. A “stay” is defined as the total number of consecutive nights spent at the same hotel, whether or not a guest checks out and checks back in again. Registered HHonors members will only receive Bonus Points for stays completed during the Promotion Period regardless of a check-in date before the Promotion Period begins or a check-out date after the Promotion Period ends. Please allow six to eight weeks from completion of your stay for points to appear in your HHonors account. Offer subject to availability at participating hotels and cannot be combined with other select offers and rates. After registering for the HHonors 2,500 points, the confirmation page reminded me of the Hilton Triple points offer for stays through 2015. P.S. – If you haven’t already signed up for the Triple Your Trip promotion, be sure to do that too and you’ll also earn Double Points during the week and Triple Points during the weekend at all hotels through December 31st. 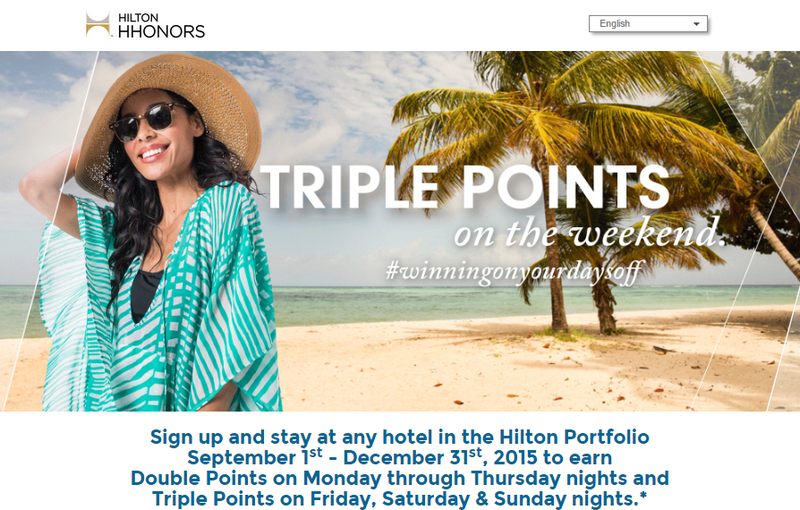 Loyalty Traveler – Hilton HHonors Triple Your Trip Sep 1-Dec 31 is satisfactory value, plus new member 2,000 bonus points – earn double points (20 points/$1) Monday to Thursday nights and triple points (30 points/$1) Friday to Sunday nights. All hotels worldwide participating.